[DECLARATION OF INDEPENDENCE]. Newspaper. The New-York Journal; Or, The General Advertiser. New York: Printed by John Holt in Water Street, Wednesday, July 11, 1776. Masthead features pro-independence snake motif. 12 x 18½ in. 4 pp. 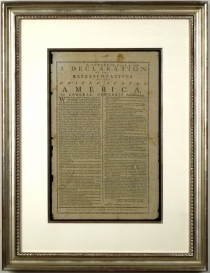 The Declaration is printed on its own page (3), in a larger font with a decorative border, because Holt intended it to be treated as a broadside. 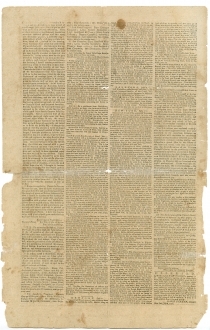 His note on the second page explains that “The Declaration of the United States of America, is inserted in this paper, in the present form, to oblige a number of our Customers, who intend to separate it from the rest of the paper, and fix it up, in open view, in their Houses, as a mark of their approbation of the INDEPENDENT SPIRIT of their Representatives.” Patriotic customers were probably inclined to hide these within weeks, when New York was occupied by British forces—a major factor to their scant survival rate. 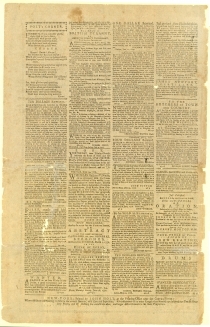 The Journal hails the Declaration as “the most important event that ever happened in the American Colonies.” War news includes a British officer’s account of the capture of transports George and Annabella by Boston patriots, “Americus” to the “People of England,” and reports on the reception of the Declaration, including New Yorkers pulling down the statue of King George III at Bowling Green, about a half-mile from Holt’s office. Advertisements include notices for runaway slaves, a reward offered for a wanted Tory, an oration on Joseph Warren, and a new play, The Fall of British Tyranny or American Liberty Triumphant. It took five days for Washington to learn that the Continental Congress formally declared America’s independence from Great Britain. On July 9, 1776, he received a letter from Hancock, along with a copy of the newly approved Declaration. The commander-in-chief had additional copies made and distributed to his brigadier generals and colonels, to be read to the assembled troops at 6:00 that evening, at City Hall Park, less than a mile from Holt’s press. The brigades were formed in [a] hollow square … One of these brigades was encamped on the ‘Commons,’ where the New York City Hall now stands. The hollow square was formed about the spot where the Park Fountain stands. Washington was within the square, on horseback, and the Declaration was read in a clear voice by one of his aides. When it was concluded, three hearty cheers were given. (Lossing’s Fieldbook of the Revolution, II: 595). The celebration was not, however, limited to a few “huzzas.” Later that night, a boisterous crowd of soldiers, sailors and local citizens headed to Bowling Green, toppled the huge, gilt lead equestrian statue of George III, and dragged it down Broadway. It was then taken away, and most of the statue was melted down. Ebenezer Hazard brilliantly remarked that the British “troops will probably have melted majesty fired at them,” and indeed the King was eventually transformed into 42,088 bullets. (Lossing: 595; The New York Historical Society has the largest surviving fragments). In any case, the next day General Washington voiced disapproval, noting that though the destruction was “actuated by Zeal in the public cause … it has … the appearance of riot, and want of order … in future these things shall be avoided by the Soldiery, and left to be executed by proper authority” (George Washington, July 10, 1776, General Orders). Celebrations of the Declaration continued for several days in the New York area. The inmates of New York City’s debtor’s prison (then housed in the City Hall, on the corner of Wall and Nassau streets) were released in a general amnesty on July 11th (Lossing, quoting a report by Holt: 595). Ten days later, pursuant to a resolve of New York’s provincial congress, the Declaration was read and published at City Hall. The people assembled “then took the British arms from over the seat of justice in the court-room, also the arms wrought in stone in front of the building, and the picture of the king in the council chamber, and destroyed them, by fire, in the street. They also ordered the British arms in all the churches in the city to be destroyed” (Lossing: 595). “This declaration has had a glorious effect,” observed Whipple. It “has made these colonies all alive…” (Whipple to Langdon, July 16, 1776). Though the Declaration of Independence boosted the spirits of the troops and patriotic New Yorkers, it did not delay the inevitable loss of the city. After meeting with Howe’s representatives at the end of the month, and refusing their offer of clemency, Washington was badly defeated in the Battle of Long Island. By mid-September, the British had occupied New York City. One of the “glorious effects” of the Declaration was to force New York to commit to independence. Holt wasn’t correct when he wrote that “the Representatives of the Thirteen United Colonies, by the providence of God, unanimously agreed to, and voted a Proclamation, declaring the said Colonies Free And Independent States.” New York, in fact, was the only hold-out, though once the Declaration reached New York’s legislature, their assent was added. 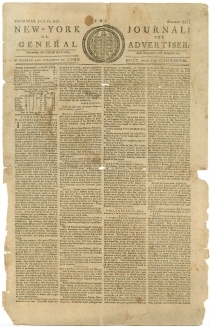 Two days earlier, in White Plains on July 9th, the New York Convention ordered 500 copies of a “handbill” (broadside) of the Declaration printed and distributed “to all the county committees of the State with orders to publish it in the districts.” It was headed by their resolve, including orders for public proclamation “on Thursday next.” (On July 10, what had been known as “the Provincial Congress of the Colony of New York” officially changed its name to the “Convention of the Representatives of the State of New York.”) That Thursday, July 11, the Declaration was read from the steps of the state capitol in White Plains. (As noted above, the public reading in New York City followed a full ten days later). John Holt (1721-1784) was born in Williamsburg, Virginia, where he received his formal schooling as a merchant, while his brother-in-law was the public printer. Holt served as mayor of Williamsburg from 1752 to 1753, and then as a deputy postmaster. He helped James Parker publish the Connecticut Gazette in New Haven from 1755 to 1760, when he moved to New York City to manage the New-York Gazette and Weekly Post-Boy. He and Parker ended their partnership in 1762, and in 1766 Holt changed the paper’s name to New-York Journal or General Advertiser. Holt also published books and pamphlets. He was forced to halt publication on August 29, 1776, when the British were about to occupy the city. As the British arrived, Holt fled the city to settle in Kingston, New York, where he resumed his newspaper briefly from July to October 1777. He published it intermittently as the Independent New-York Gazette in Poughkeepsie, New York, from 1778 to his death. Water Street, originally one block long, was first extended by landfill in 1692 to hold the waters of the East River. Holt’s business was located “near the Coffee-House,” a three-story brick inn and meeting place on the northern corner of Broad and Water Streets. Holt’s business was on the same block of Broad Street as the famed Fraunces Tavern (c. 1720), at the intersection of Pearl Street, less than a mile from the present-day New York Stock Exchange and Federal Hall. Formerly owned by a mid-western private collector. Cincinnati Museum Center; Huntington Library; New York Public Library; Westchester County Archives, and one in private hands. Brigham, Clarence S. History and Bibliography of American Newspapers, 1690-1820 (Worcester, Mass: American Antiquarian Society, 1947). Deshler, Charles D. “How the Declaration Was Received in the Old Thirteen,” Harper’s New Monthly Magazine, Vol. 85, Issue 506, July 1892, 165-187. Lossing, Benson J. Fieldbook of the Revolution, 1859. Sotheby’s. “The First Printing of the Declaration of Independence,” May 21, 1993. Sullivan, Dr. James, ed. The History of New York State (Lewis Historical Publishing, 1927). Regarding typesetting and visual power, Holt’s paper is more displayable than many of the broadside printings. 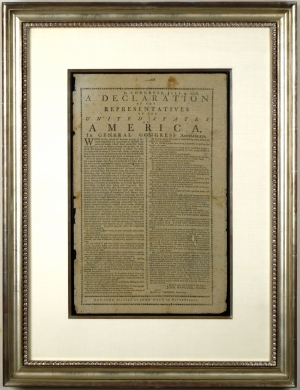 It is a very rare New York issue of the Declaration, from July of 1776, printed blocks away from George Washington’s army as New York was just about to become the center of the conflict.